All profits I make will be going to St. Nicholas Church, where the story takes place. It’s a YA book and is only available as an ebook at the moment, which is a shame but the publisher will print if I can sell enough ebooks. I’ve managed to get a piece in the local paper but so far, the diocese newspaper hasn’t published anything about it, neither has my local paper (I live in Brentwood, so they may think it’s not newsworthy as the church I’m raising money for is in Basildon). The book is only £1.81 on Amazon, so you can imagine, when I get my cut, which will go to the church, it’s not going to be a fortune! So, I need to sell a lot. I understand if you think it wouldn’t fit anywhere on your website but any help you can give me, would be gratefully received, thanks! 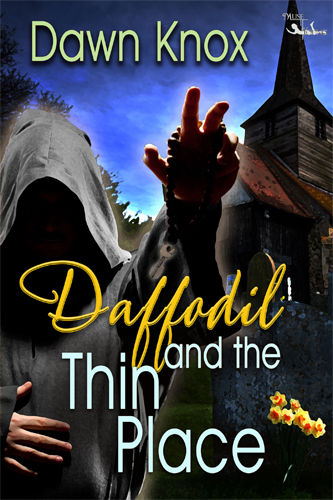 It can be found here http://museituppublishing.com/bookstore/index.php/museityoung/daffodil-and-the-thin-place-detail and there is some information about the book as well as links to all major ebook sellers, including Amazon. 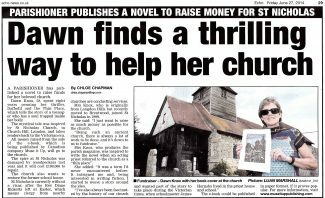 A PARISHIONER has published a novel to raise funds for her beloved church. Dawn Knox, 58, spent eight years penning her thriller, Daffodil and the Thin Place, which tells the story of a teenager who has a soul trapped inside her body. The mystical tale was inspired by St Nicholas Church, in Church Hill, Laindon, and takes readers back to the Victorian era. All money raised from the sale of the e-book, which is being published by Canadian company Muse it Up, will go to the church. The spire at St Nicholas was damaged by woodpeckers last year and it will cost £100,000 to repair. The church also wants to restore the former school house. St Nicholas is currently without a vicar, after the Rev Diane Ricketts left at Easter, which means clergy from nearby churches are conducting services. Mrs Knox, who is originally from Langdon Hills but recently moved to Brentwood, joined St Nicholas in 1999. She said: “I just want to raise as much money as possible for the church. Mrs Knox, who produces the parish magazine, was inspired to write the novel when an acting priest referred to the church as a “thin place”. She added: “It was a term I’d never encountered before. It intrigued me and, being interested in writing fiction, I started to weave a story around the idea.